Company "A", recruited in Lonaconing, Maryland, and led by Captain Alexander Shaw and Lieutenant John Douglas, was ordered to attack. Supported by the remainder of the regiment, Company "A" advanced at quick step to the center of the bridge. Here, to their surprise, they discovered that the plank flooring had been removed. (9) Startled, the Marylanders halted, turned, and at the same time received a volley from the Virginians. Retreating in confusion, the company ran to shelter among the rocks. Again shots were exchanged with the Virginians across the river. Prior to the ill-fated charge Colonel Johns had heard firing in the direction of Romney. This now had ceased. Johns assumed that General Kelley had forced the Mechanicsburg Gap and was in control of the town. (10) Although Johns and his men had not taken Romney and cut off the Confederate retreat, the Colonel felt his mission accomplished as he had diverted some of the Virginia Militia from the main fight at the Mechanicsburg Gap. 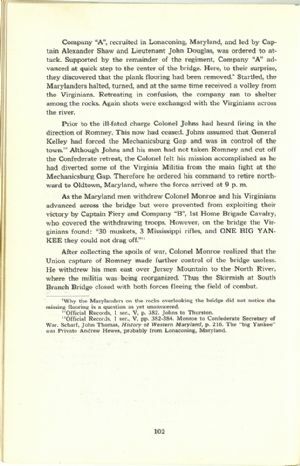 Therefore he ordered his command to retire northward to Oldtown, Maryland, where the force arrived at 9 p. m.
After collecting the spoils of war, Colonel Monroe realized that the Union capture of Romney made further control of the bridge useless. He withdrew his men east over Jersey Mountain to the North River, where the militia was being reorganized. Thus the Skirmish at South Branch Bridge closed with both forces fleeing the field of combat. 9 - Why the Marylanders on the rocks overlooking the bridge did not notice the missing flooring is a question as yet unanswered. 10 - Official Records, 1 ser., V, p. 382. Johns to Thurston. 11 - Official Records, 1 ser., V, pp. 382-384. Monroe to Confederate Secretary of War. Scharf, John Thomas, History of Western Maryland, p. 216. The "big Yankee" was Private Andrew Hewes, probably from Lonaconing, Maryland.